Founded in II 3320 or shortly thereafter.  All other dates are conjectural: the city was abandoned some time in the Third Age1. It was refounded by Aragorn after the War of the Ring. The city of the Kings of Arnor, on the shores of Nenuial. The city was founded by Elendil himself, on the shores of the northern lake Nenuial, near the sources of the Baranduin. It was the chief city of the Kings of Arnor for several centuries, and home to one of the three palantíri of the North-Kingdom. The available evidence suggests that the city survived for nearly a thousand years. In the early days of Arnor, it must have been one of the glories of Middle-earth. Soon after its founding, the numbers of the Dúnedain of the North began to dwindle, and the population of Annúminas seems to have fallen throughout its history, until eventually it was deserted. At that time the Kings removed to Fornost to the east. 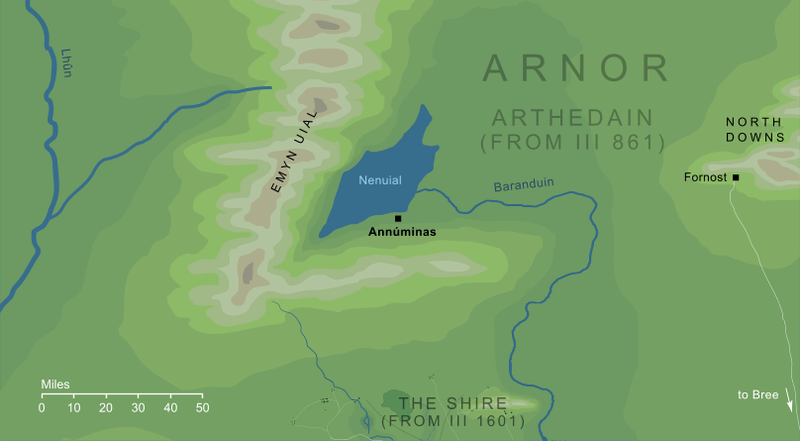 It seems likely that the people of Annúminas were dependent on the River Baranduin for their contact with the outside world. While the Hills of Evendim surrounded the city to the west and south, the city's people could reach the other cities of the Dúnedain that lay along the river3 by boat. After the city's desertion, it fell into decay, but two relics of its greatness survived: its palantír and the Sceptre of Annúminas. The palantír remained in Middle-earth for more than a millennium after the loss of its city, but was ultimately drowned with Arvedui in the cold northern seas. The silver Sceptre of Annúminas was the symbol of Kingship in the North-kingdom. A very ancient thing, it was originally the rod of office of the Númenórean Lords of Andúnië. It would have been removed to Fornost by the Kings, and eventually came to be kept by Elrond in Rivendell, it retained the name of its ancient home of Annúminas. At the time of the coronation of Aragorn at the end of the Third Age, Annúminas had lain in ruins for more than two thousand years. Aragorn refounded the city as a seat of Kings, and dwelt there at least for a time. At the Council of Elrond, Elrond recounts some of the history of Annúminas: '...after the war and slaughter of the Gladden Fields the Men of Westernesse were diminished, and their city of Annúminas beside Lake Evendim fell into ruin; and the heirs of Valandil removed and dwelt at Fornost...' (The Lord of the Rings II 2 The Council of Elrond). This suggests an early abandonment, perhaps even by Valandil's immediate successor, Eldacar. The earliest date possible, then, is III 249, the year of Eldacar's accession, but the phrase 'heirs of Valandil' suggests that Annúminas was abandoned somewhat later than this. It seems reasonable to assume that Annúminas was abandoned some centuries later, at the time of the break-up of Arnor in III 861, and this seems to be confirmed by a note in volume 12 of The History of Middle-earth: 'After Eärendur the Northern Kingdom of Arnor was broken up ... Annúminas became deserted owing to the dwindling of the people.' (The Peoples of Middle-earth I 7 The Heirs of Elendil). 'West-tower' is a literal translation into English, but not an entirely happy one. The Elvish word annûn is strictly not just 'west' but 'in the direction of the sunset'. Hence, Annúminas can equally be rendered 'Sunset-tower'. This is particularly relevant because the city lay in a region called Evendim (that is, 'evening twilight'). At Arnor's height, there were settlements of the Dúnedain throughout Eriador. According to The Silmarillion, they '...dwelt in many places in Eriador about the courses of the Lhûn and the Baranduin...' (from Of the Rings of Power and the Third Age). None of these settlements seem to have survived to the end of the Third Age. Original content © copyright Mark Fisher 1999-2001, 2009. All rights reserved. For conditions of reuse, see the Site FAQ.